Michael Pritchard, a 26-year veteran of the Secret Service, encouraged students to follow their dreams as he has followed his, in a speech on April 14. Pritchard, vice president of Global Security, is in charge of the protection of Hunt Oil Company in Texas, a company that owns 30,000 acres in Carbon County. Pritchard was visiting the property when he met College of Eastern Utah criminal justice instructor Steve Burge and agreed to speak on campus. He explained to CEU students, his history in the military, law enforcement and the Secret Service. He joined the Marines as a young man and received an honorable discharge in 1970. 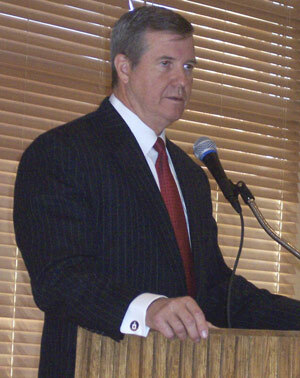 After the Marines, Pritchard received a bachelor’s degree in criminal justice from Georgia State University. He went to graduate school at George Washington University and Johns Hopkins University. He began his law enforcement career as a police officer and then homicide detective with the Atlanta Police Department. As a member of the Secret Service, Pritchard protected presidents Ford, Carter, Bush, Reagan, Clinton and Bush. He protected many heads of state, foreign leaders and important dignitaries, Jesse Jackson and Pope John Paul II are also among the people Pritchard has worked with. He conducted assignments to investigate or protect in 38 countries. He retired as a member of the Government’s Senior Executive Service and is on the Executive Board of Former Agents of the United States Secret Service. Throughout his career, Pritchard was stationed in Memphis, Tenn.; Washington, D.C.; Jacksonville, Fl. ; Charlotte, N.C.; Houston Texas; and he retired from Dallas, Texas. Pritchard was given the job, under President George W. Bush, of detail leader. That is the agent who is directly responsible for the president. He or she walks right next to the president and is responsible for reporting if anything happens. Pritchard told CEU students, “You can do anything you want to and don’t let anyone tell you, you can’t.” He said that what prepared him best for his job was living life and paying attention to what was going on in the world. He told students to “read, and read non-fiction. Read newspapers, different newspapers and become familiar with the world.” He advised students to study atlases, to know geography and the historical roots of things. At the closing of Pritchard’s speech, Student Body President Dan Wood, presented him with two awards from CEU; one for his dedication to higher education and one to Hunt Oil Company in appreciation of their help in the community.